Haven't signed up? Join now! 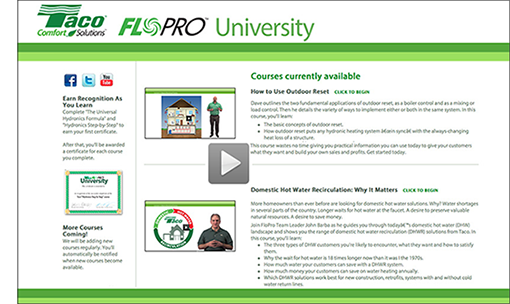 Hydronic training that is convenient, comprehensive, clear and concise. Practical, real-world content you can use right away. Courses designed to make it easy to learn on your own computer, and at your own pace. Lessons you can view and review in as little as 5 minutes. Self-testing so you can be sure you know what you learned. FloPro University is here to help you do your best work. Get the online training and support you need to help you be a stronger, better professional. When you JOIN THE FloPro® Team, University opens its doors free of charge. Each course contains lessons and quizzes. You can repeat any section, any time, until you fully understand the subject matter. FloPro U's curriculum is written for real world, real job situations. From the Universal Hydronics Formula to Variable Speed Pumping and more, you'll learn the theories and applications to help you work better and smarter. Courses are taught by John Barba, nationally known head of training at Taco, Inc.
As you complete University courses, you'll be recognized for your advanced training accomplishments with a certificate for each course you complete successfully. Use it as evidence of your professional knowledge when selling your services.